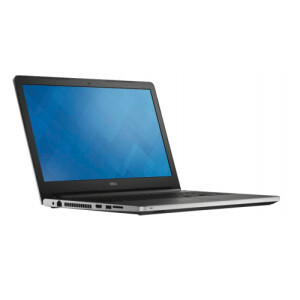 Dell Inspiron 15 5555 Drivers Download - Dell Inspiron 5555 is a 15.6-inch laptop powered by your choice of latest AMD processors, from E1 up to A10. The choices include E1-7010, E2-7110, A4-7210, A6-7310, A8-7410, and A10-8700P. Those processors have integrated AMD Radeon M300 Series graphics card. If you need more powerful graphics, you can choose optional discrete GPU AMD Radeon R5 M335 or Radeon R6 M345DX. The 15.6-inch display is available in HD touch, HD non-touch, and FHD touch. The storage device is a 2.5-inch HDD with Intel Smart Response Technology. With two SODIMM slots, users can upgrade the system memory up to 16 GB. Ports located on the left side include a power-adapter port, a network port, an HDMI port, and a USB 3.0 port. On the right side, there are two USB 2.0 ports and a headset jack. Connectivity features supported by this 2015 Inspiron 15 5000 laptop are Bluetooth 4.0, Wi-Fi 802.11ac or 802.11b/g/n, and 10/100 Mbps Ethernet. Above the screen is a 0.92 megapixels webcam with HD 720p video recording capability. The keyboard is available in backlit version too. On audio side, it has a pair of 2 W speakers with Waves MaxxAudio. It weighs starting at 2.24 kg (4.94 lb). asfadriver.com provide download link for Dell Inspiron 15 5555 Drivers, download drivers directly by clicking download button.